In 1994 award-winning chef Cindy Hutson met her life partner, Delius Shirley. With an inherit passion for cooking, but no formal training and three kids to care for, Hutson was hesitant to open her first restaurant venture. Against the odds and with the extra support of Shirley, Hutson took the leap of faith and that same year opened Norma’s on the Beach. Rave reviews touted Hutson’s cuisine as “the best Caribbean restaurant in South Florida” and international support from USA Today, TheNew York Times, London Times, Chicago Tribune, Chef Magazineand Eater,who named Hutson “Chef of the Year” (2012), helped set the pace for what would develop into a thriving culinary future. Hutson’s culturally diverse and seasonally driven culinary style is heavily influenced by her extensive travel and food history. Her signature “Cuisine of the Sun” is a self-coined approach that means to create without limits and cook everything under the sun, infusing nuances of her famous island flavors throughout. “I thrive on teaching about our earth’s bounties, edible history and utilizing indigenous ingredients that are regionally prepared,” says Hutson about her culinary inspiration, which is apparent in her many regionally-inspired Caribbean concepts. More than 20 years later Hutson and Shirley have built a culinary empire with the successful opening and operation of more than eight award-winning concepts. Currently, the dynamic duo run their seventeen-year-old love-child, Ortanique on the Mile in Coral Gables, Florida, which opened with Esquire andBon Appétitacknowledging it as one of the “Best New Restaurants” and Condé Nast Travelerawarding it as one of their “Hot Table” concepts; and their six-year-old Ortanique on the Crescent at Camana Bay on Grand Cayman Island, which has been praised by Caribbean Journal as one of the “Top 50 Best Restaurants” in the Caribbean. 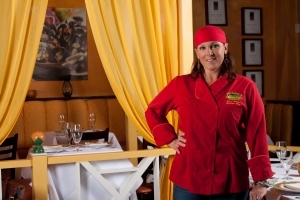 Hutson published her first cookbook, From the Tip of My Tongue (Story Farm),which received the prestigious 2015 Gourmand World Cookbook Award for “Best Woman Chef Cookbook in the United States.” In February 2016, Hutson opened Zest, a contemporary fine dining concept, and Zest MRKT for “grab and go” in downtown Miami’s Southeast Financial Center. The 3,500-square-foot restaurant and its adjacent market will both feature menus inspired by Hutson’s multi-ethnic and seasonally inspired “Cuisine of the Sun.” Additionally, Hutson and Shirley opened a Zest concept at The Cliff Hotel in Negril, Jamaica on December 1st2015, where her world cuisine is now enjoyed overlooking breathtaking views of the pristine Caribbean Sea. The restaurant has been revered as top 25 restaurants in the Caribbean. She is the celebrity chef/culinary ambassador for the Miami Cancer Institute (Baptist Hospital) that opened January of 2017 and developing foods with ‘Miracle Fruit’. And now consulting for Le Tropical Brewery in collaboration with Heineken in Wynwood, Miami for the launch of their brewery and beer garden, opening Fall 2019. When Hutson is not in the kitchen, she can be found lending her culinary expertise to the food community by hosting events, intimate cooking classes and mentoring young women through the James Beard Foundation’s Women in Culinary Leadership program about breaking through the culinary world’s “glass ceiling.” She is a culinary ambassador for Certified Angus Beef and the National Pork Board, and she has served on the board of the Miami-Dade County Culinary Council, Idaho Potato, and Egg Board as their “Egg-cellent” chef. She recently received the American Red Cross Spectrum Award 2017 for Women’s excellence in Hospitality.